Sholazar Basin (pronounced SHOL-uh-zarh) is a tropical jungle basin in the midst of Northrend. It is found between Borean Tundra and Icecrown. The region's climate and safety from the Scourge is maintained by pylons, erected by the Titans. Recently, one pylon in the east has fallen and the Scourge have taken this opportunity to invade from Icecrown to the north. They are now streaming down The Avalanche. In Sholazar Basin, players take part in a faction war between the wolvar (Frenzyheart Tribe) and the gorlocs (arctic cousins of murlocs). The various gorloc tribes have gathered together to form the group called the Oracles. Players are only able to choose one side, but are allowed to easily change to whichever faction they wish to be allied with. When the Titans shaped Azeroth, Freya designed Sholazar Basin to be an area for experimentation along with Un'Goro Crater and the Vale of Eternal Blossoms. All three locations were places where the power of the Well of Eternity had coalesced. The Wild Gods emerged from these cradles of life. 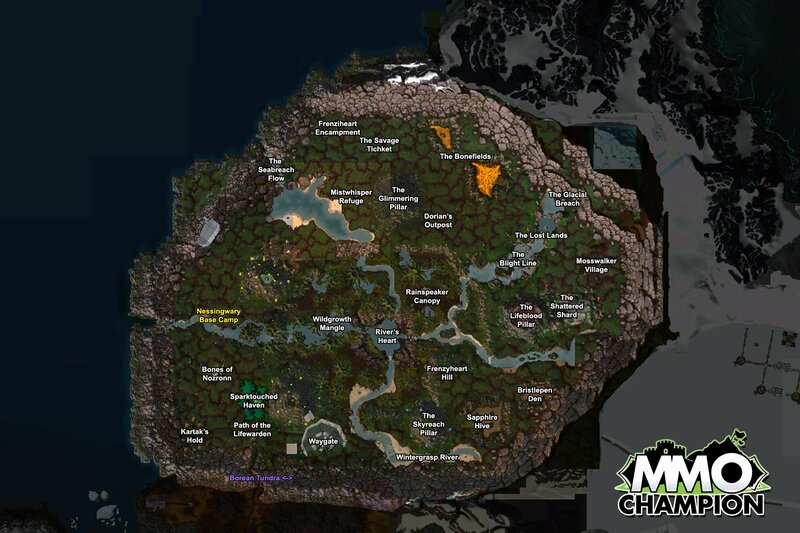 Sholazar Basin is the home of both the Oracles and the Frenzyheart Tribe. Both are constantly at war with eachother, and players will choose to align with one faction at a time through one of the main quest chains of the area. Players can switch their chosen faction by repeating the last quest in the starting chain and killing/saving the character of the opposite faction (  A Hero's Burden). Sholazar Basin also has its own hidden reputation, which is currently unused, that will increase as faction dailies are completed, and will not decrease if a player decides to switch factions. Map of Sholazar Basin in Lands of Mystery. Sholazar Basin fills the northwest corner of the Borean Tundra and is difficult to believe it is part of Northrend. Like Kalimdor's Un'Goro Crater, the Sholazar Basin is an anomaly. To get there you will have to climb a nasty ridge to reach it. Once you top that ridge, however, you will be looking down into a lush tropical jungle. Hot springs dot the basin and you will have to watch out for steam vents and geysers — they will cook the flesh from your bones in an instant if you get caught in one. Thick vegetation fills the basin, and birds and small animals are everywhere. So are insects. 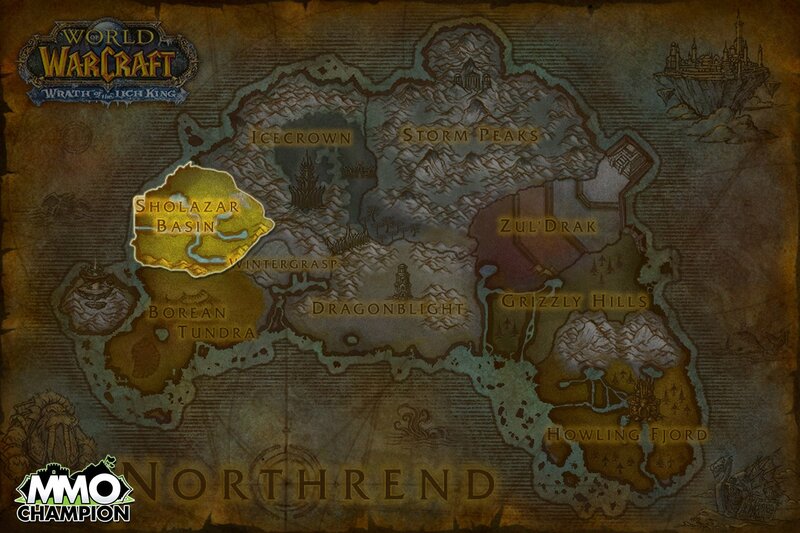 In the past, the Dragonblight was the most fertile region in Northrend followed by Sholazar Basin. After it became a wasteland, the Basin took its place. A high elf scholar that once visited Kaskala believed the Titans used the Sholazar Basin as a testing ground. Some of their experiments, or at least the remains of those experiments, may still exist. Thus, the basin is a potential treasure trove of knowledge and power. In Lands of Mystery, this area was treated as a subzone of the Borean Tundra instead of its own zone. At the co-ordinates [38, 37] , a hatch with the numbers "5 9 16 17 24 43" can be found as a reference to the series Lost. The naming of subzone The Lost Lands may be a reference to the Land of the Lost, which both Sholazar Basin and Un'Goro Crater seem to be based on. Sholazar Basin, like Un'Goro Crater, is littered with mysterious Titanic crystals that can be activated through structures or watchers when the need arises. Patch 7.3.5 (2018-01-16): Level scaling implemented, previous zone level: 76 - 78.